It’s more a technology driven experience for the customer, rather than standing in a queue to be seen by a cashier or teller. It’s all technology driven. “I cut my teeth in the micro-fi- nance and consumer credit indus- try in South Africa with African Bank, in the late 90s” he recalls. African Bank had identified a lower income percentile of the popula- tion, offering financial services that the dominant South African banks – Standard, Absa, Nedbank, and FNB – had complacently neglected. The “big four” have reappraised matters in the meantime, noting the huge success and growth of Capitec (and for that matter Afri- can Bank, although it failed in 2014, quickly receiving support from the South African Reserve Bank to re- sume trading). But Van Niekerk en- joys first mover advantage, taking the decision in 2009 to join former colleagues from African Bank, to found MyBucks. 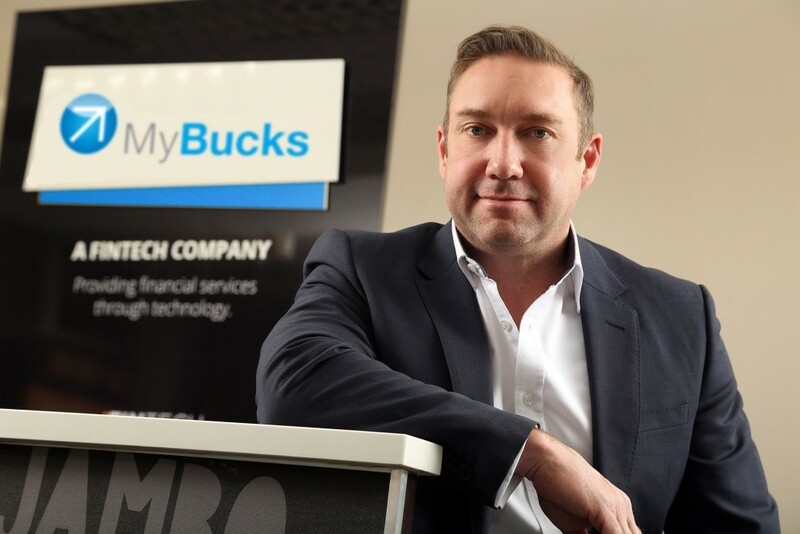 Phenomenal growth Van Niekerk took a year or so to thoroughly research what was then called digital financial services (now termed fintech), launching MyBucks, headquartered in Lux- embourg, in 2011. It has a portfo- lio of products offering banking – GetBanked; lending – GetBucks; and insurance – GetSure, as well as credit reports and budgeting tools. Growth since My Bucks’ inception has been nothing short of phenom- enal, and the company passed two important watersheds last year. The first, in June, was to initiate a listing on the Frankfurt Stock Ex- change with an initial public offer- ing that raised €15.5m ($16.5m). The float enabled MyBucks to complete a strategy of pan-African expansion through the acquisition from Opportunity International of three banks, one savings and loans company, and two non-bank fi- nancial institutions. It added Ghana, Tanzania, and Mo- zambique to the MyBucks pan-Af- rican footprint and complemented existing operations in Kenya, Mala- wi and Zambia (as well as two Euro- pean countries, Poland and Spain). Opportunity International (OI) is now a minority shareholder in My- Bucks. OI is a global non-profit or- ganisation that aims to help people in developing countries work their way out of poverty. Founded in 1971, the organisation has to date pro- vided more than $9bn in micro-fi- nance loans and equity finance. At the end of 2015, OI served more than 12m clients in 28 countries across Africa, Asia, Latin America and Europe They were using an OI loan, savings account, insurance policy or training programme to improve their lives. More than 95% of Opportunity’s loan clients are women who would otherwise have difficulty accessing financial ser- vices because of legal and cultural gender inequities in many devel- oping countries. For OI, what must have been one of MyBucks main attractions was the MyBucks’ proprietary credit decision making and scoring tech- nology, a platform called Jessie which enables the distribution of financial products at a highly com- petitive cost, rapidly scaling up the business and effectively managing credit risk. There is also a platform that uses sophisticated algorithms to root out fraudulent loan applications. Currently, MyBucks’ non-perform- ing loans run at some 7.3%. Social responsibility Public relations counsel Sam Am- sterdam says what he finds particu- larly intriguing about the MyBucks’ model is the corporate social re- sponsibility element. He describes it as “philanthropic in its very nature.” Opportunity International Global CEO Vicki Escarra agrees, but goes further. “Fintech holds tremendous potential to increase financial inclu- sion and help Opportunity Interna- tional reach more people in need faster with life-changing access to financial solutions, training and oth- er services to help them break the cycle of poverty, transform their lives and strengthen their families and communities. “Not only can fintech make these products and services more acces- sible, it can also make them more affordable by lowering the cost of doing business for the financial in- stitution, a savings which can be passed on to the consumer. But as with any corporate social responsibility (CSR) initiative, there is the question of whether the pro- ponent is simply taking over the state’s responsibility for caring for its citizens. When this question was put to Escarra, she told African Banker: “Government funding [to OI] fits well with our aspirations. And so the MyBucks story continues. They have just released their latest trading figures which reveal that in the full year June 2015–16, revenues rose to €38.9m. Strong growth, as the OI assets are fully integrated into the MyBucks brand, is anticipated for the year ending June 2017.